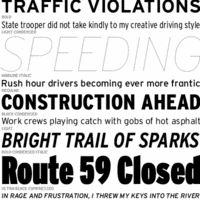 Interstate is the beautiful font is derived from the signage alphabets of the U.S. Federal Highway Administration. Created by Tobias Frere-Jones, these amazing letterforms can be absorbed at a glance! In fact, they can be seen all around. Interstate ensures a genuine edge over quick communication. The font is highly recommended for usage in books, magazines, newspaper, and even the corporate world.